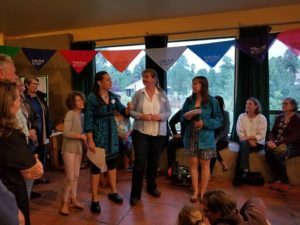 8/23/18 Annual Celebration – What an Event! Wow! We are still trying to recover from yesterday’s amazing event. 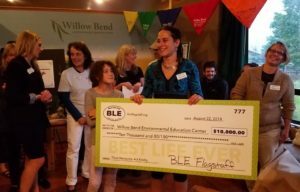 The Willow Bend Annual Celebration, is our opportunity to recognize and thank our partners, funders, and volunteers, and an opportunity for our members and the community to come together and support environmental education. Our fundraising goal for our Summer Appeal, which includes a mailed out membership drive and the Annual Celebration, is $5,000. This amount allows us to plan our fall programs and invest in supplies and materials needed for the entire school year. Vice Board President, Michele James, and her family getting their picture taken with Rakudachan. The event started with a light drizzle, which got us worried. We were afraid no one would show up. But by 5:05 pm people were already lining up to get their picture taken and meet Rakudachan, Flagstaff’s only camel! Rakudachan is 14 months old, and belongs to Board Member Eric Souders, who brought him to the event, as a special attraction. After all, you can’t get your picture taken with a baby camel everyday. The line for Fratelli Pizza. Fratelli Pizza set up under the ramada, and even the drizzle, which now turned into rain, didn’t keep people away from the delicious, oven fresh pizza served on site. 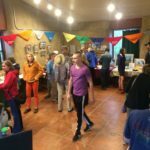 Friends of Flagstaff’s Future provided reusable plates and cups, part of their Zero Waste Program, and we had composting stations, so no waste was generated during the event! 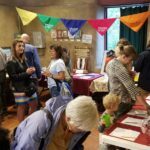 The kids activities, face painting, and live music was set up inside the Center, as well as tables full with beautiful and valuable donated items for the silent auction. Auction items included massage gift certificates, art, restaurant gift cards, and antiques. 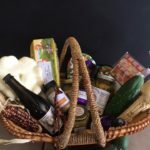 We also had a raffle, which included lots of fun items, and a grand prize, a $150 value basket from the Flagstaff Community Market. Willow Bend staff fro left to right: Moran Henn, Executive Director, Cassandra Roberts, Education Director, Melissa Eckstrom, Education and Outreach Assistant. Eagle Scout vlunteer James Dorn, who helped establish the Monarch Butterfly Waystation and his award. 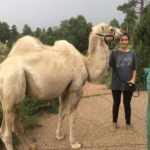 After everyone had enough to eat, socialize, bid on items, take pictures with the camel and buy raffle tickets, we all came inside for acknowledgements and thank you’s. 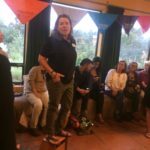 Moran Henn, Willow Bend’s Executive Director, introduced the Center’s staff, board of directors, founding CNRCD board members and interns. 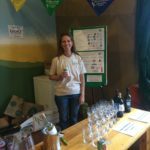 We then took the time to thank all our amazing volunteers who make our work possible and help us reach our goals and achieve our mission. Each year, we then present certificates of appreciation to a selected number of volunteers who really went above and beyond! This year we acknowledged: Mike Masek, Mike Dechter, Daniel Foley, and Norm Lowe for sharing their skills, time and enthusiasm. Our MVM (Most Valuable Member) was Jack welch, and the Business Partner of the Year went to Findley Toyota. We also presented a special certificate to Fratelli Pizza for sponsoring our dinner for the second year in a row. But Henn was not the only one with a surprise that evening. 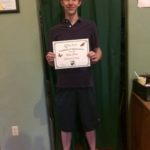 BLE (Best Life Ever) Flagstaff, a local organization dedicated to random acts of kindness and making a difference in people’s lives, had one too! They had contacted the Willow Bend staff earlier in the week, asking if they can attend the event and present a small gift for Willow Bend’s efforts. No one had suspected that the humble gift was a $10,000(!!!) check! You can read all about BLE and their gift in the AZ Daily Sun article, covering the event. A very surprised (and happy) Henn shared all the wonderful things Willow Bend can do with this sort of support. Board President Ariel Leonard ended the presentations part of the evening, thanking everyone for their support, and urging them to continue their involvement with Willow Bend. 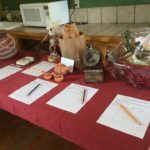 With only a little time left till the end of the evening, everyone got to enjoy ice cream, finish bidding on silent auction items, and hope they win the Community Market Basket as the number were drawn. The event was a HUGE success! Thank you to everyone who attended, donated, volunteered, and supported! 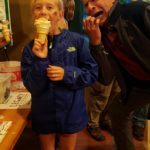 We are excited to announce that we have reached and far exceeded our $5,000 goal and we are looking forward to seeing you in the classroom, on the trails, or at the Center during one of our programs or events! 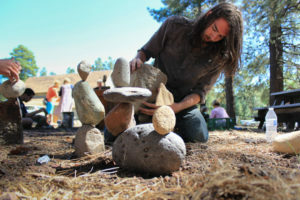 Flagstaff Arts Council and Willow Bend Environmental Center are pleased to announce the Annual Back West Celebration of Stone Balancing. The art of stone balancing involves working with different stones and their surface to get them to balance on one another in intriguing ways. Back West Celebration of Stone Balancing is a three day event, taking place between Sep 21st-23rd, with demonstrations from experienced stone balancers as well as opportunities for the general public to observe, learn, and participate. This year’s celebration will kick-off with a meet and greet, short demonstrations, and reception outside Criollo on Friday, Sep 21st from 3-6pm. 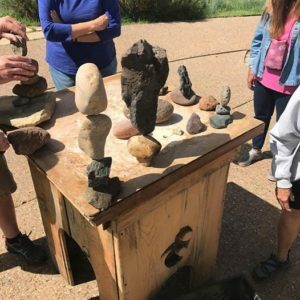 Then, on Saturday, Sep 22nd from 9am-4pm, Willow Bend will host an educational presentation followed by ongoing Stone Balance artist demonstrations and hands on activities for the community. A Stone Balancing art exhibition with painting and photography from multiple artists is featured in the center and the closing reception for the exhibit will take place from 2-4pm with live music and catered refreshments. The community event is free and open to the public. 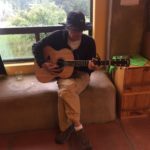 On Sunday, Sep 23rd from 9am-12pm the Coconino Center for the Arts will host a workshop for those wanting to learn more. The workshop will include a video presentation by Michael Grab, a discussion on the aesthetics of Stone Balancing and the place and time for stone balances in nature by local artist and landscape designer, Pieter Schaafsma, and demonstrations of different stone balancing techniques by four expert stone balancing artists, Simone Campisano, Peter Juhl, Bob Bernal and Douglass Case. Following the theater presentations, participants will have the opportunity to go outside for hands on learning and practice, based on the styles and techniques learned from the experts. Workshop registration fee is $25/participant or $15 for Flagstaff Arts Council and Willow Bend Members and for students. Register online and secure your spot! Our amazing board member, Holly Taylor, is leaving the board after serving for many years in various positions and roles (board president, treasurer, secretary, volunteer bookkeeper, and financial committee chair). We truly can’t thank Holly enough for everything that she has done for Willow Bend! Holly was born in Washington, DC and grew up in in Durham, NC. She graduated from Swarthmore College with a degree in economics. She worked for the federal government and the City of Atlanta as a budget analyst. She then worked for her husband’s architectural firm for 12 years, before they retired and moved to Flagstaff in 1997. In addition to part-time work as a bookkeeper/administrative assistant at several places in Flagstaff, she has been involved with various non-profits, helping with building projects, and serving on boards for Literacy Volunteers of Coconino County, Flagstaff Arts Council, and, of course, Willow Bend. Holly promised that even though she won’t serve on the board, she will continue volunteering with us. Thank you Holly! Today marks the first day of our new fiscal year! Which means we are busy planning and preparing our 2018/2019 school and community programs. Please consider making a donation during our Summer Appeal (July-August 2018) and help us reach our $5,000 fundraising goal. 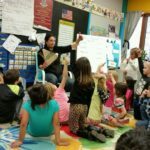 Your support will help us reach more students, organize more community events, and serve more teachers. 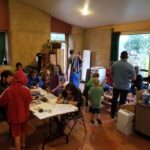 With little funding for education, especially environmental education, your donation makes a big difference. Become a member or renew your membership and receive discounts and free access to our adult workshops, family science events and more, make a one-time Summer Appeal donation , or become a business sponsor and support us during this important time. Willow Bend is a 501 (c) (3) non-profit organization and your donation is tax deductible. 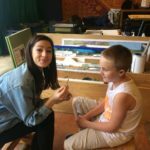 Support local, award winning environmental education TODAY! Almost a hundred volunteers helped at the Willow Bend gardens on Memorial Day weekend. On Saturday, volunteers focused on enhancing wildlife habitat by adding pollinator plants, bird feeders, and bat boxes. 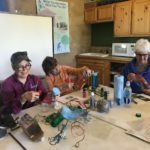 Volunteers from American Conservation Experience, bird lovers, and members from the Friends of the Willow Bend Gardens worked for over 3 hours making and placing beautiful bird feeders, butterfly puddlers, and at houses. They trimmed the willows by the pond, and planted milkweed and other pollinator friendly plants. 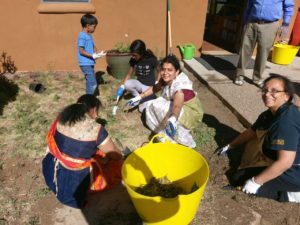 Then, on Sunday, volunteers from Sathya Sai International Organization who were attending their annual meeting at NAU, prepared the gardens for the summer. They removed invasive plants, took out old signs, turned the soil, planted, and collected litter along the trail and the gardens. Special thanks to the Friends of the Willow Bend Gardens volunteer group for organizing these efforts! Plastics recycling in Flagstaff is changing and you will no longer be able to recycle certain types of plastics in your curbside recycling bin. Until now, we have been able to recycle all types of plastic, numbers 1-7, as long as they were rigid. As of June 1st, 2018, the only types of plastic that will be accepted for recycling are numbers 1 and 2 with a focus on on plastic bottles, jars and jugs. These changes stem from changes in the national and international recycling market. The recycling market has been significantly impacted due to the Chinese government no longer accepting certain types of recyclables as imports. Until recently, China has accepted roughly half of the world’s plastic and paper recyclables. The sudden ban on much of these materials has sent international markets for recyclables into a tailspin. 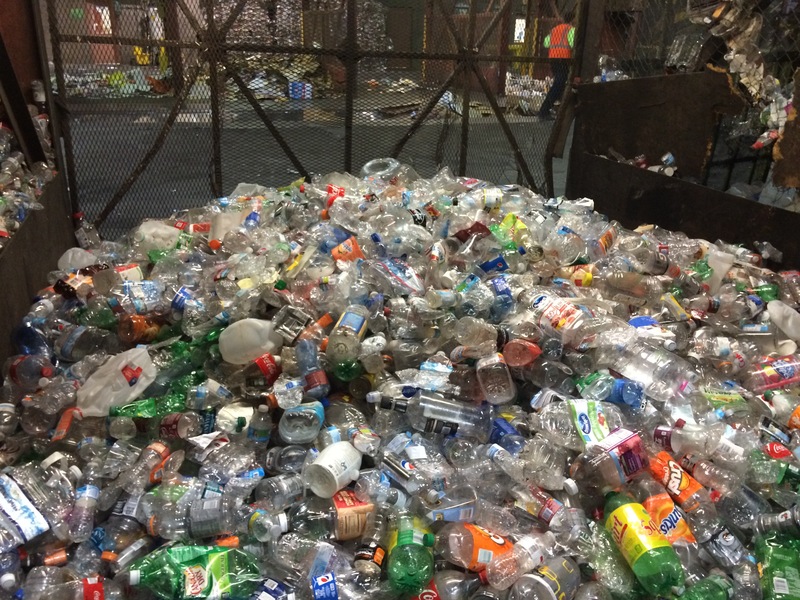 Norton Environmental, the company responsible for sorting and selling Flagstaff’s recyclables, has been unable to find buyers for these types of plastic. Flagstaff is not alone, as many other communities around the country have been forced to remove items from their acceptable materials list or send significant amounts of formerly recyclable materials to the landfill. These changes provide an opportunity for all of us to reflect on the purpose of recycling. Recycling reduces the demand on natural resources, lowers the energy needed to create the products we use daily, and saves valuable landfill space. While it can feel good to put all of our trash in the recycling bin, doing so negates the benefits of recycling. To realize the benefits of recycling, only the correct types of plastics can be recycled – wishful recycling must stop. Going forward, focus on recycling your plastic bottles, jugs, and jars. This includes beverage, toiletry, and soap bottles, as well as milk jugs and peanut butter jars (just make sure they are clear of any food). Bags, wraps, take-out containers, and produce containers are NOT recyclable. Make sure to keep recycling your cardboard, paper, and cans. While you’re at it, touch up on recycling basics by visiting our online recycling guide at www.recyclebycity.com/flagstaff. The best thing that we can do is to reduce single use items (especially plastics) and choose durable and reusable items. Avoid throwing items in either your recycling or trash bin. Don’t forget to bring your own reusable mug or carry a reusable water bottle or shopping bag with you on the go. Find out what you can do to prevent waste by visiting www.flagstaff.az.gov/BYO. To find out what the City is doing to reduce the impacts of Flagstaff’s waste and consumption, visit http://flagstaff.az.gov/3361/Waste or contact our Zero Waste Coordinator at 928-213-2158 or dlenzen@flagstaffaz.gov. To learn more join us on a tour of the recycling center, every first Friday at 1pm. 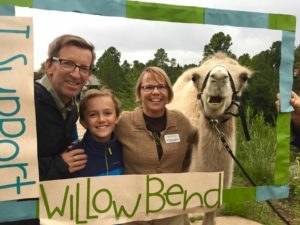 Flagstaff, AZ-May 7th —Willow Bend Environmental Education Center and partners are pleased to announce that we are being offered a grant award of $38,337 for our successful Heritage Grant application titled “Habitat Restoration and Watchable Wildlife Enhancement at Sawmill/Willow Bend AWWE (Arizona Watchable Wildlife Experience) Site”. 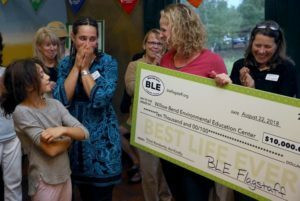 Funds from the grant will be used to support school and community wildlife programs, interpretive signage, interactive habitat displays, garden restoration, and a new ADA accessible wildlife-watching platform at the Willow Bend AWWE site. 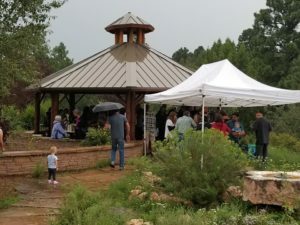 This project is part of a formal partnership between Willow Bend, Coconino County, the AWWE group, and the City of Flagstaff Storm Water Management for on-going restoration and environmental education efforts at Willow Bend/Sawmill Park. 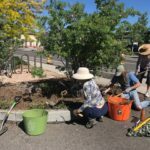 The project is also supported by matching funds from the Coconino County Board of Supervisors and Coconino County Parks and Recreation. “We were so excited to receive funding for this impactful project” said Moran Henn, Willow Bend’s Executive Director. 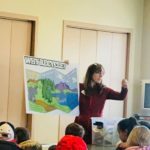 Cassandra Roberts, Willow Bend’s Program Director added that “the goal of the project is to promote an understanding of and an appreciation for our local wildlife and habitat”. 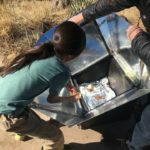 Cynthia Nemeth, Coconino County Parks and Recreation Director added that “This grant is extremely welcomed as it will go a long way towards engaging the public, especially children, in the outdoors. 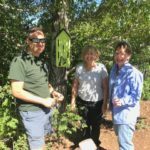 The ADA accessible watchable wildlife platform is a very important feature made possible through this grant. 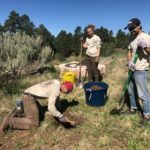 Coconino County Parks and Recreation is proud to be a partner in a project with so many positive outcomes”. “Programming will begin soon and over the next two years you can expect to see a lot of restoration work, installation of new interpretive signage and interactive displays, construction of the wildlife watching platform and of course many students watching birds, learning about wildlife and taking pictures” concluded Henn. The Heritage grants are supported by revenue from Arizona Lottery sales and are available to projects that focus on wildlife and habitats across the entire state. For more information about Heritage funds visit www.azgfd.gov, for information about AWWE sites and events visit www.www.azwatchwildlife.com, and to learn more about Willow Bend visit: www.willowbendcenter.org. 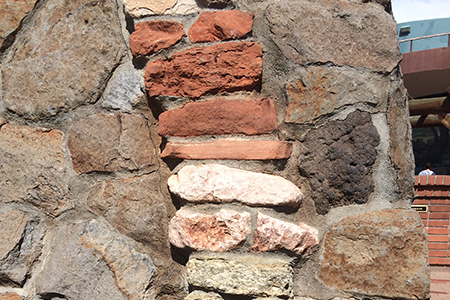 4/16/18 Downtown Geology Tours This Summer, Watch the Promo! 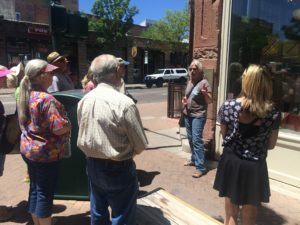 We are very excited to announce that through generous funding from Mountain Sports Flagstaff and 1% for the Planet, we will be offering guided Downtown Geology Tours for the third summer in a row! Tours will be offered twice a month between June – September. For a full schedule, visit our tour program section on our website. 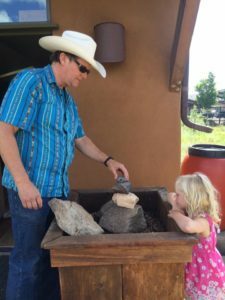 Participants will search for fossils on the Ice House walls, find out what stone is referred to as “Arizona Red”, visit the layers of the “Grand Canyon” at Heritage Square, view beautiful stone etchings, and more. Watch the 1 minute tour promo! Tours are FREE and open to the public. All ages welcome. We will kick off the tours during First Friday June 1st 6pm-9pm at Mountain Sports Flagstaff! Raffle, free gifts, tour tickets, and more! 4/1/18 April is Water Awareness Month! Did you know? April is Water Awareness Month! 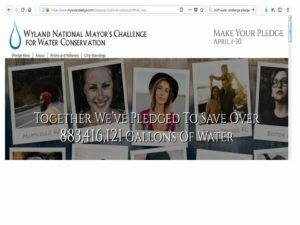 “My Water Pledge” is a friendly competition between cities across the US to see who can be the most “water-wise.” Last year Flagstaff WON the national competition saving millions of gallons of water. This year Flagstaff is currently in second place, trailing closely behind Westminster CA. TAKE THE PLEDGE NOW (before the end of April) and put Flagstaff on the map again! Plus, YOU CAN HELP WILLOW BEND WIN a 2018 Toyota Rav4 Hybrid, and you can win prizes too! Hundreds of dollars worth of sustainable gifts, coupons and items will be raffled. How do you participate? Take the pledge here. 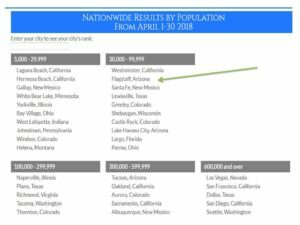 Choose Flagstaff, AZ for your participating City. 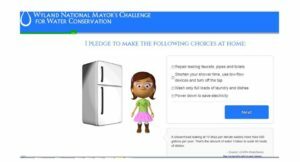 Then, on each page you can select the actions you are going to take to save water.The site will add up the amount of gallons saved by each one of your selected actions and let you know how many total gallons you saved! At the end of the pledge you will be asked if you want to enter the prize drawing and you can select an organization to win a brand new hybrid! 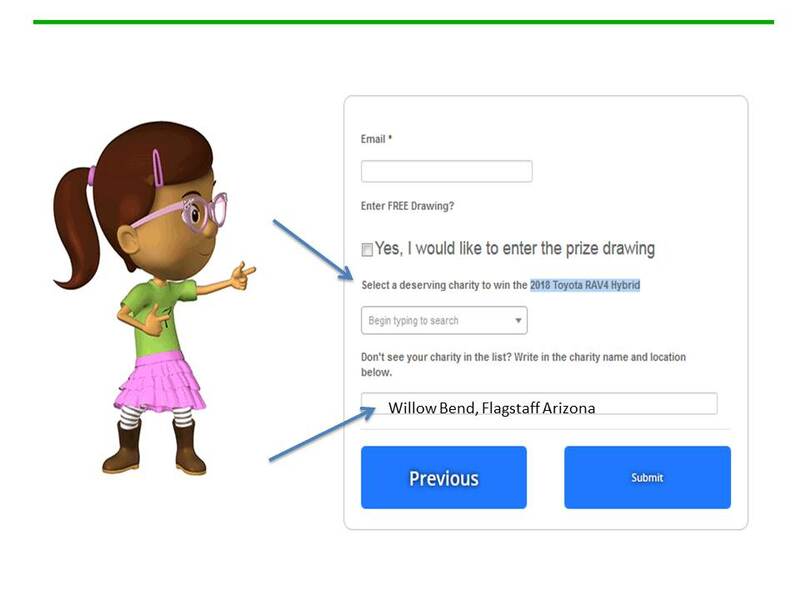 Enter in “Willow Bend, Flagstaff Arizona”! 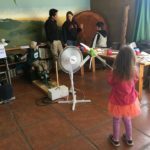 This month’s Science Saturday focused on Renewable Energy! 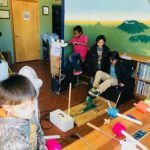 We had awesome activities such as windmill designing from Arizona Wind for School, power bikes made by Flagstaff’s very own Ward Davis, solar powered toys, a solar panel, and other solar activities from Prometheus Solar, sun art, and a solar oven to make s’mores (yum). 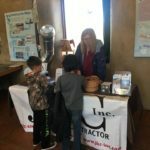 This year we also had a Solatube on display from Flagstaff Skylights by JKC, to show alternative lighting methods for an energy efficient home. Thank you to everyone who attended! And SPECIAL thanks to our sponsors, Prometheus Solar, Wind for Schools, and Flagstaff Skylights from JCK. We couldn’t have done it without your “energy” and enthusiasm!